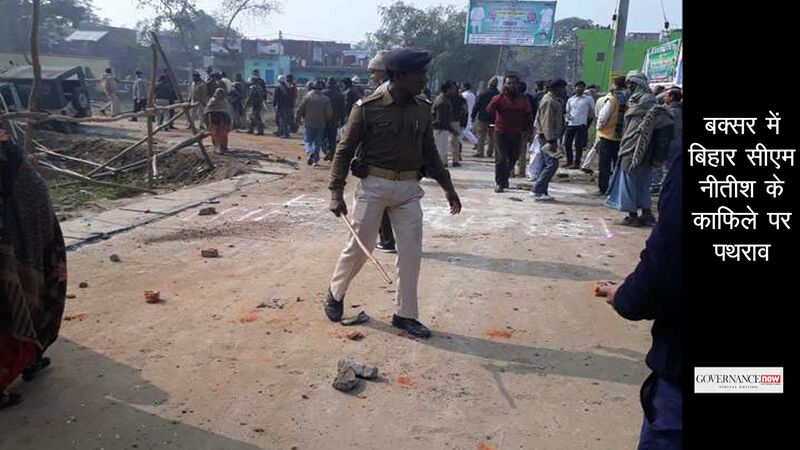 Police forces of Andhra Pradesh and Telangana got into an ugly brawl over water row between the two states. 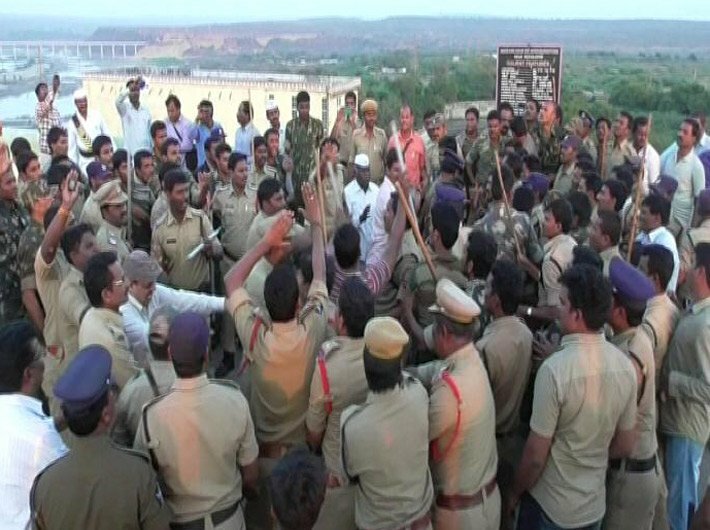 Scene at Nagarjuna Sagar dam area was quite shocking as two law enforcement forces collided over the issue. Eventually, their common Governor ESL Narasimhan had to intervene to ensure that the water row is amicably solved. The world’s largest masonry dam over Krishna river is located between Guntur district of Andhra Pradesh state and Nalgonda district of Telangana. It was late evening on Friday in NagarjunaSagar when officials of AP forced into the dam area to get water released from NagarjunaSagar but were stopped by their Telangana counterparts. Behind them were their respective state police, who eventually came to blows. The special protection force of the centre deployed at the area had to intervene to stop the fight. Andhra Pradesh upped the ante and threatened to complain to the Centre against Telangana. Telangana irrigation minister T Harish Rao said: "We are ready to share the water in the reservoir and have been asking them what exactly they want with regard to their requirement. They are not coming forward. What can we do?" AP irrigation minister Devineni Umamaheshwara Rao said Telangana has stopped release of water from the Nagarjunasagar right canal. "The right canal and the power house belong to AP government and Telangana has no right to stop water to the right canal. Telangana is holding the keys and not returning them to our officials. Now, irrigation of over 6 lakh acres of crop in the Krishna delta is at stake," Devineni told media. The AP irrigation minister said unless Telangana relents and withdraws its 'unilateral stoppage of water', he would be forced to take the issue to Union water resources minister Uma Bharti. At the same time, AP irrigation officials said they would not hesitate to prise open the control room at Nagarjunsagar and take the keys of the right canal from Telangana. "Since water for the farmers is of utmost concern now, we will wait and watch for two more days as Telangana officials promised to release about 2,000 cusecs. If that does not happen, we will be forced to take a drastic decision," said an irrigation official. According to him, AP has so far utilized 137.49 tmc from the right canal against an allocation of 132 tmc. However, since AP can also avail 32.25 tmc of water from the left canal, it is seeking another 15 tmc to protect the existing crops in Prakasam and parts of Guntur districts. However, Harish Rao denied that his government stopped release of water to AP from the right canal and in fact, extended an olive branch to the residuary state. "I did not order any stoppage of water from the right canal. 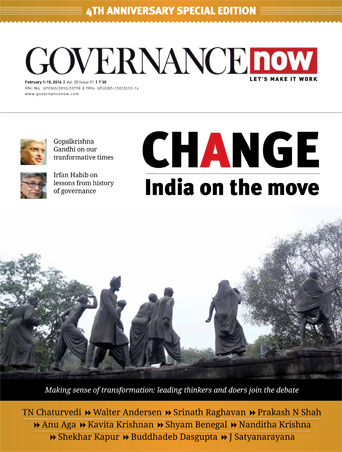 In fact, the Telangana government wants a quick and amicable resolution to the dispute over sharing of Krishna river water, including the water from Nagarjunasagar," Harish Rao told this correspondent. On Saturday, two Chief Ministers Chandrababu Naidu and K Chandrashekara Rao met in the presence of Narasimhan at Raj Bhavan in Hyderabad. The state governments decided to see that standing crops in both the states are saved. Irrigation Engineers-in-Chief (ENCs) of both the states would sit and decide on release of water. "It was decided in the meeting that, as per availability of water in Nagarjuna Sagar dam, crops in the two states should be saved in the larger interests of farmers," Harish Rao has said. "It is decided that the two states should very carefully use the available water so that crops don't dry up. ENCs of both states should sit, discuss and see that crops both in Telangana or Andhra are saved," he said. It was also decided that the policemen from both the states and political workers would not be allowed to go on to the dam.